It's Fall and everybody is going pumpkin crazy again. And who doesn't love a good Pumpkin Spice Latte from the local coffee shop? If you're in the mood for something a little different, yet still want that pumpkin taste, then you might try some pumpkin cider. 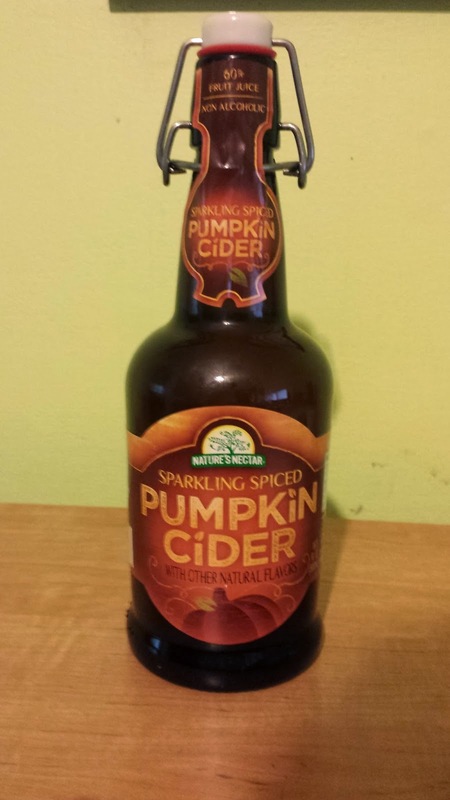 I happened upon a few bottles of Sparkling Spiced Pumpkin Cider from Nature's Nectar. It's bottled by the Aldi corporation and, as far as I can tell, it can only be bought in their stores. A bottle will run you about two dollars. Sparkling Spiced Pumpkin Cider comes in a nifty flip top which makes the bottle great for re-use. It's also non-alcoholic, although I'm thinking it would taste even better with a shot of rum. Or, you might toss in a shot of Jack Daniels, heat the whole thing up a bit and call it a "Jack O'Lantern". Here's the real kicker: Nature's Nectar Sparking Spiced Pumpkin Cider isn't really pumpkin cider at all. No pumpkins were pressed into juice in order to make this delicious concoction. No, Aldi pumpkin cider is just sparkling apple cider with pumpkin spice added. Had I not read the label, I would have had no idea because you can really taste the pumpkin in it. It actually tastes a lot like sparkling pumpkin pie juice. If you're still in the pumpkin mood, then you might try making a little pumpkin pie pudding. It's a really simple recipe. All you need to do is whip up a package (5 1/10 oz) of your favorite vanilla pudding, add in a can of pumpkin (15 oz) and then add a teaspoon of pumpkin pie spice (cinnamon also works). The kids and I made this last weekend and it went over really well. For some extra fun, buy some popsicle molds from your local dollar store and put the pumpkin pie pudding in them. Freeze them for a few hours and you've got pumpkin pie pudding pops.